Peter Albert Todd was named Poet Laureate of the City of Gloucester, Massachusetts, in August, 2014. Peter died during his term as laureate, on December 15, 2015. The seventy-two year old Gloucester native had written poems for the city’s World War II Memorial and for the Fishermen’s Wives Memorial and other monuments and many events in the city. A self-taught poet, Todd wrote “on demand” for individuals and events. Also prolific, with over 800 poems to his credit, Todd was often inspired to write on placemats and other handy materials. Mr. Todd’s website is: thepoetryofpeteralberttodd.weebly.com. Ruthanne (Rufus) Collinson is the outgoing Poet Laureate of the City of Gloucester. Her energetic work in schools, at the Writer’s Center, and in other venues was a model of the role of Poet Laureate. When she was named to the post, former Mayor Bruce Tobey praised her poetry’s “Craftsmanship and precision…really wonderful. I saw it and felt it.” Collinson grew up in a Concord Street neighborhood where she was the only girl, and once worked as a reporter for the Gloucester Daily Times, started writing plays as an 8-year-old and penned her first poem at the age of 9. She now lives downtown near the Fort. – to publish, hardcover and electronically, a book of poetry by and about Gloucester to showcase the many fine writers active in the city, mirroring Gloucester’s diversity and talent, and created in the spirit of Gwendolyn Brooks, who wrote: “Be yourself. Don’t imitate other poets. You are as important as they are.” This website was established to further those goals and was the source site of the poetry in Salt and Light: An Anthology of Gloucester Poetry, published in the spring of 2010. Mr. Ronan’s website is: TheRonan.org. Vincent Ferrini was the city’s first poet laureate. The honorary post was created in Gloucester in 1998 after Councilors John Foote and Dean Harrison created the position for him, capping his half-century of literary achievement. Mr. Ferrini died Dec. 24, 2008. He was 94. A summary of Mr. Ferrini’s distinguished career in poetry is available at: http://en.wikipedia.org/wiki/Vincent_Ferrini. Anne Babson Carter, winner of the prestigious Four Way Book Prize for Strike Root, lives and writes in Gloucester. Pat Lowery Collins, an accomplished poet, painter and novelist, has won national and regional honors for her work. She lives and works in Gloucester. Ruthanne (Rufus) Collinson has worn many occupational hats, but the most consistent through the decades has been that of poet. She lives in central Gloucester and often uses the city as a theme in her work. Joseph Featherstone and his family have lived in Gloucester — part-time or full-time — for almost fifty years. His love for the city, especially East Gloucester, is reflected in his poetry collection titled Brace’s Cove. The Fishermen’s Wives Memorial Poetry Contest, held in the spring of 2010, was a competition for Gloucester residents to honor the Fishermen’s Wives Memorial, including the statue by Morgan Faulds Pike. The contest was a success with dozens of poets entering finely crafted work. The winner was Diane Giardi for her poem, “The Fishermen’s Wives.” Her poem appears on the Fishermen’s Wives page, along with the poems of the runners-up: Wayne Soini, Nancy LeGendre, and Douglas Goldman. The Quarterdeck Poetry Contest, held in the summer of 2009, was a competition for Gloucester residents to honor the iconic The Man at the Wheel statue on the city’s waterfront. for a Massachusetts quarter. The winner was Pamela Mansfield, for her poem, “Verdigris – The Man at the Wheel.” Her poem appears on the Quarterdeck page, along with the poems of the runners-up: Amber Gailitis, Neal Kleindienst, and Lydia Priest. John J. Ronan has published widely and won national honors for his poetry, including being named a National Endowment for the Arts Fellow. His latest book, Marrowbone Lane, appeared in January of 2009. Stephen Scotti was a renowned composer and musician and singer who also wrote poetry. A resident of Gloucester for many years, he is especially known for his work setting American and Irish poems to music. Seascape Poems are important to a community that depends on the ocean for industry, art and leisure. The poets included here range from Rose DiMaria, whose father and husband were fishermen, to T. S. Eliot, whose Dry Salvages is about that shelf of rock off Cape Ann. Nancy Seidman was a frequent visitor to Cape Ann where her daughter, Kate Seidman, lives. Student Poets Thousands of students have participated in the Gloucester Lyceum’s annual Poetry Without Paper competition and the work is among the best being written in Gloucester. The winners included here are: Lydia Anderson, Mila Barry, Willow Barry, Andrew Bergeron, Sean Bergin, Heather Boudrow, Aidan Breen, Kate Bresnahan, Willa Brosnihan, Jaclyn Canillas, Emma Chandler, Cathy Cusumano, Britany Diamond, Meghaen Favazza, Lucinda Fox, Niava Friday, Anya Fulmer, Jordan Gentile, Seth Grover, Jemma Johnson-Shoucair, Charles King, George King, Alexandra Lees, Aislinn McCormack, Alexandra McKay, Erin McManus, Alessandra Moceri, Kaitlin Nicolosi, Billy O’Donnell, Enzo Paganetti, Emily Ryan, Elijah Sarrouf, Kazira Slocum , Wilhelmina Rolf Thaemert, Rumi Thomas, Moriah Thornley-Murphy, Katina Tibbetts, Mark Turner, Samantha Turner, Phoebe Weissblum, Josie West, Jordan Westlingand, and Sara Zuidema. Additional student poetry can be found at the Gloucester High School’s literary website, The Elicitor. Peter Todd, a Gloucester native, was a self-taught poet. He read often at functions in Gloucester, describing how his own background was entwined with the city’s. 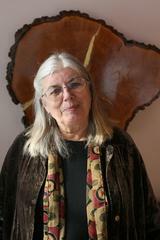 Frances Wosmek is a writer of children’s books and a poet. She has won many national honors for her work and is vibrant and creative in her 90’s. Frances lives in the Magnolia neighborhood of Gloucester. Vincent Ferrini was preceded by a long tradition of poetry in his adopted city. His friend and colleague, Charles Olson, began his American-Gloucester epic, The Maximus Poems, in 1950 and the the work, though unfinished as his death in 1970, has gained worldwide recognition. Other twentieth century poets who lived in or wrote of Gloucester included Herb Kenny, Percy MacKaye, Kitty Parsons, and Lora Clark. Earlier, at the turn of the twentieth century and in the nineteenth, the list of writers included Lucy Larcom, Clarence Falt, Elizabeth Phelps, and Hiram Rich. Probably the most famous poet to write about Gloucester remains Henry Wadsworth Longfellow for his ballad, The Wreck of the Hesperus. This is a very short list of Gloucester poets, or poets writing about Gloucester. A full list of poets or other writers inspired by Gloucester might stretch to T.S. Eliot, Rudyard Kipling, and even H.P. Lovecraft, but that is beyond the scope of this website. The links below will help in researching Gloucester poetry and poets. a 501-C-3 charitable non-profit corporation.